Day 3 was not as nice weather-wise as Days 1 & 2 - Day 3 was rainy. Boo. We set off walking anyway, me wishing I had taken my raincoat with hood instead of the travel umbrella. 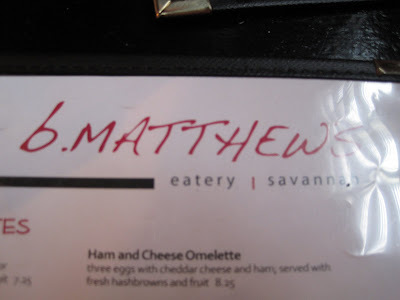 We started off in search of a late breakfast/early lunch at B. Matthews Eatery, a few blocks from the hotel. It was around 11 am and there was about a 15 minute wait to be seated. I ordered decaf coffee; SP got Yankee tea. There was a mix of locals and tourists at the restaurant. 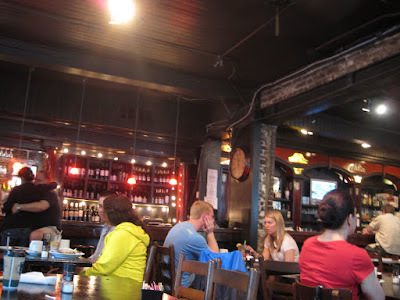 B. Matthews claims to be Savannah's oldest tavern - it's cozy and comforting inside. 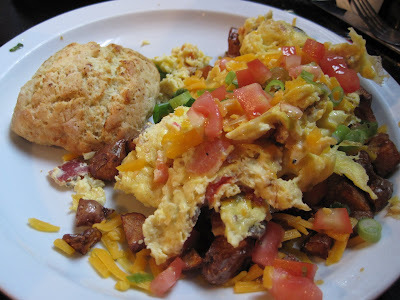 I ordered the Bay Street Scramble: "Homecut hash browns smothered with scrambled eggs, applewood smoked bacon, mushrooms, tomato, green onion and cheddar cheese served with made-from-scratch biscuit." So good. So filling. SP helped me finish every last bite. It was delicious, but the size was just large enough that I couldn't eat the entire dish myself! 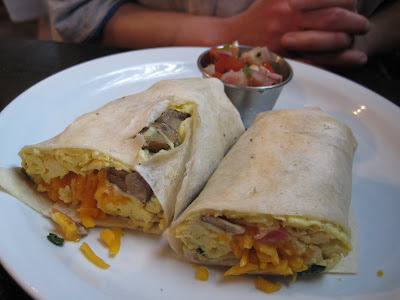 SP had the Breakfast Wrap: "Flour tortilla, shredded cheddar cheese, fresh scrambled eggs and your choice of hickory smoked bacon or fresh Georgia pork sausage. Served with fresh salsa." He ate his entire meal. 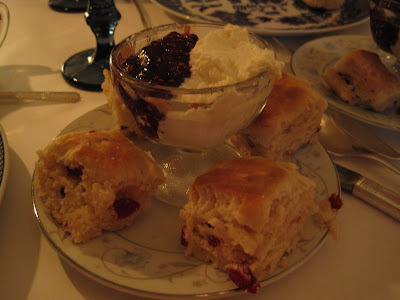 Very tasty and filling breakfasts - we felt ready to venture out into the drizzle. 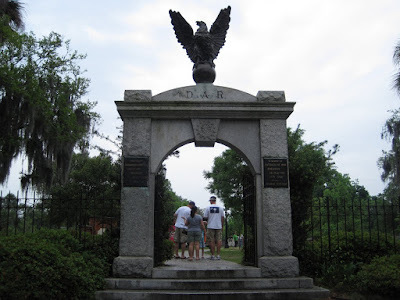 We started off walking down Abercorn Street and through the squares along that street, stopping at Colonial Park Cemetery: There are over 10,000 people buried in the cemetery and supposedly the Union used the globe (ball) on the arch entryway for target practice during the Civil War. 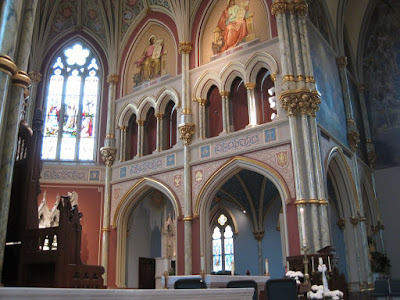 We also stopped at the Cathedral of St. John the Baptist: Beautiful and ornate. 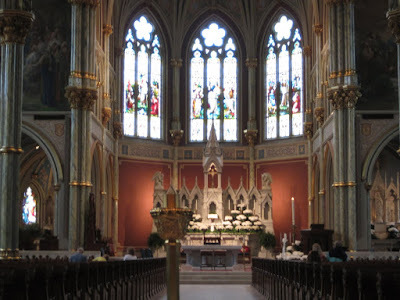 Maybe even too ornate. 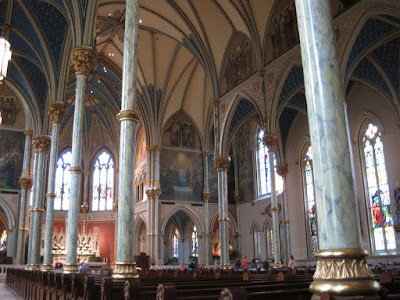 But very impressive. 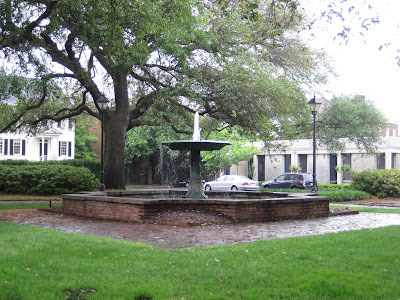 We walked over a few blocks and then started back 'up' on Habersham Street, passing through even more picturesque squares with fountains and/or monuments. 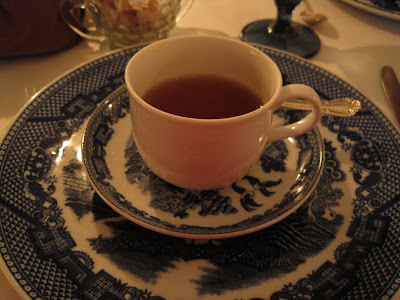 By this time, we were ready to be out of the on and off light rain, so we decided to have some hot tea at Savannah Tea Room. We had to wait about 10 minutes for a table, but that gave us time to browse all the tins of teas and the tea merchandise for sale: brewing baskets, teapots, tea cozies, tea books - all sorts of tea goodies! 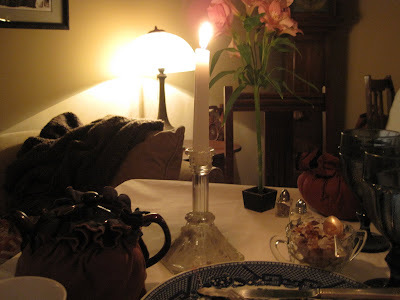 The room we were seated in was dimly lit with candles burning on each table even though it was only around 2 pm. There was a fireplace with two comfy chairs in front and a coffee table, plus a couch alongside one wall. It was very cozy. Naturally, after browsing all those tea goodies, I had to have a Savannah tea souvenir! I have always wanted a proper tea cozy. Usually I wrap a kitchen towel around a teapot! There were tea cozies printed with Savannah sights and 'Savannah' on them, so I decided that would be a nice souvenir. Not just a pretty tea cozy but one with a Savannah theme! We also bought a black teapot for our tea cozy. After more wandering, we headed back to the hotel for a rest. I think we both fell asleep while watching a movie on TV! When we woke up, we decided to freshen up and head out for dinner. 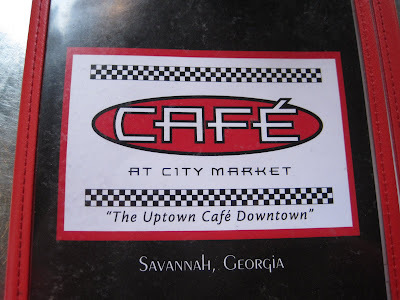 It was still drizzly and we didn't feel like walking too far, so we chose a place at City Market: Cafe at City Market. We sat outside -- there was an awning over the outdoor seating so we were protected from the drizzle. 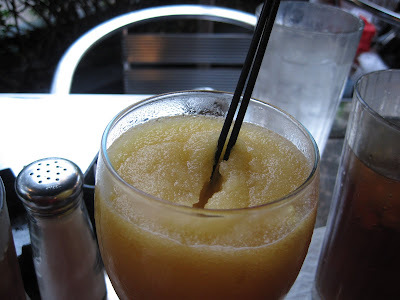 Our server mentioned their drink special of the day: Mango Daiquiri, and for some reason that sounded really good. We also ordered Yankee iced teas. 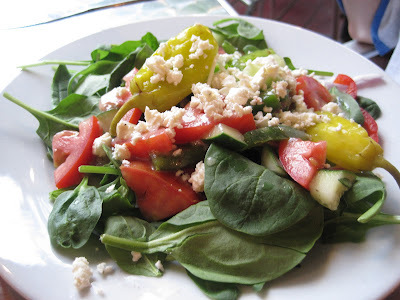 SP decided on a Greek Salad for his meal: fresh spinach, pepperocini, feta cheese, tomatoes, cucumbers, red onions, boiled egg and kalamata olives. I, too, was craving vegetables, so I got a side salad: The dressing was a Raspberry Walnut Dressing - very good and not too sweet like some raspberry dressings. 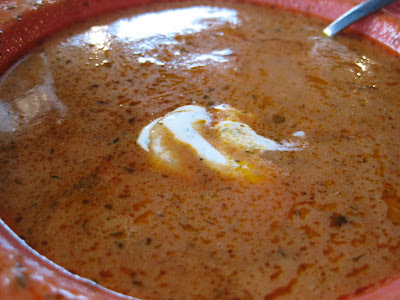 I couldn't resist the Cream of Tomato Dill soup: I shared the soup with SP. This soup was so good! You could really taste the dill, which is one of my favorite herbs. We both quickly slurped up the soup - yum!!! 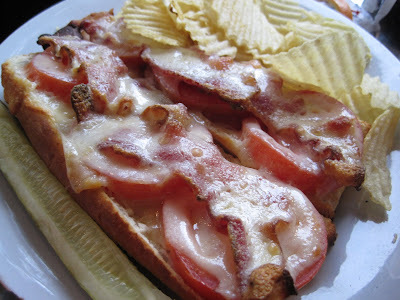 I also got the Grilled Tomato & Vermont Cheddar with Smoked Bacon Sandwich: served open-faced on French bread with fresh basil. This was also very tasty. SP ate about 1/3 of it. There was a lot of food - and I made myself eat the entire salad. 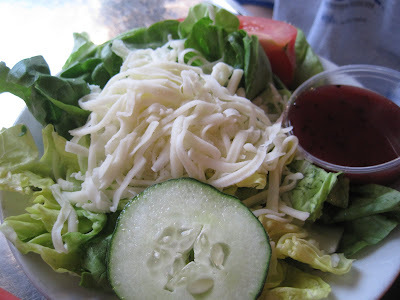 For some reason, on vacations, I seem to rarely eat veggies, so I wanted to eat all my side salad. My only complaint is that the salad entree and my sandwich arrived before I had barely touched my side salad and soup - I don't like having so much food in front of me and I didn't want the soup or sandwich to get cold, so I was trying to eat quickly, which is against my nature (I am a slow eater!). We were too full to get dessert at the restaurant. We decided to walk over to a cupcake store, but a quick search on SP's Droid told us it was closed for the day. 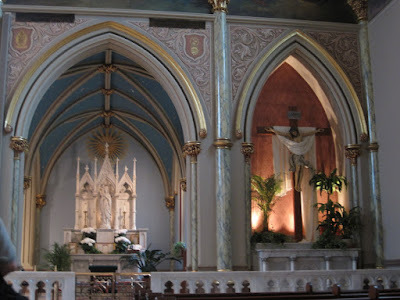 So instead we wandered some more in the City Market and over toward the east side of the historic district. After a bit of walking and shopping/browsing (we like to look at all the menus posted outside restaurants! ), we decided to go to Leopold's Ice Cream. 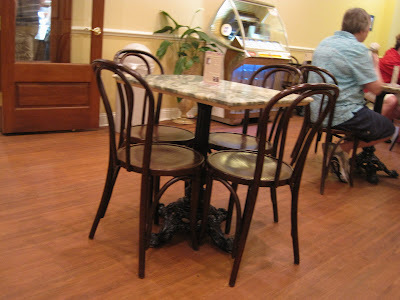 It's very cute, old-style ice cream shop inside: One of the original owner's sons is a movie producer in Hollywood and when he decided in 2004 to re-open the ice cream shop, he enlisted the help of an Academy Award nominated designer to design the interior. 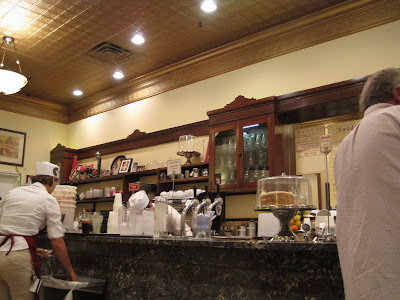 The designer used many of the original fixtures, including the original soda fountain, soda fountain cover, back bar, sundae holders, banana split boats, and malted milk dispenser. Even the old Philco radio and the wooden, interior phone booth from the old store are being used. There are framed movie posters on the walls, beautiful marble topped tables, and delicious sounding ice cream flavors like Tutti Frutti, Savannah Bee Honey Almond, and Peppermint. 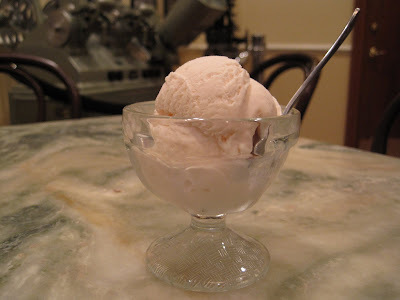 I was too full from dinner to have even a child's scoop, but I did taste SP's Japanese Cherry Blossom ice cream, which was a very lightly flavored cherry ice cream: Along our walk back to the hotel, we browsed through a few stores, including Savannah Candy Kitchen. 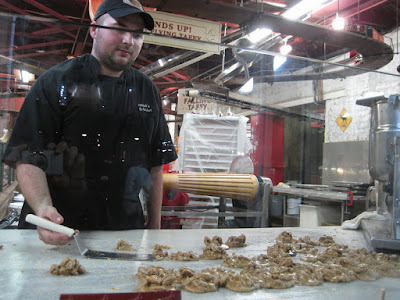 Is there anything better than walking into a candy store and being greeted by a server offering warm praline candy samples? Yum! 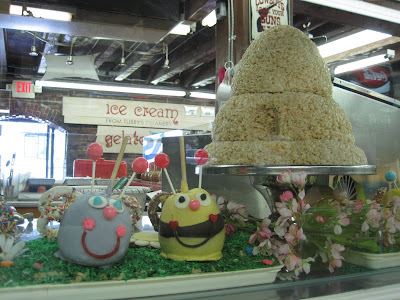 They have lots of chocolate covered goodies, truffles, pralines, and candy apples, including these on display: A butterfly and a bumble bee - and a rice krispie beehive! So cute! 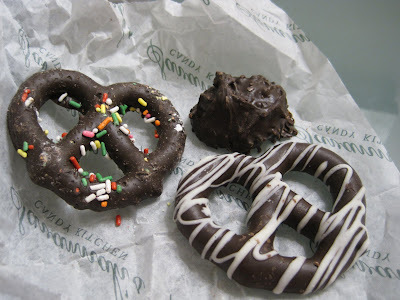 We picked out a couple of treats: chocolate covered pretzels for me and a nut cluster for SP. Then it was back to our hotel and our super comfy bed! A lovely Day 3, in spite of the drizzle.